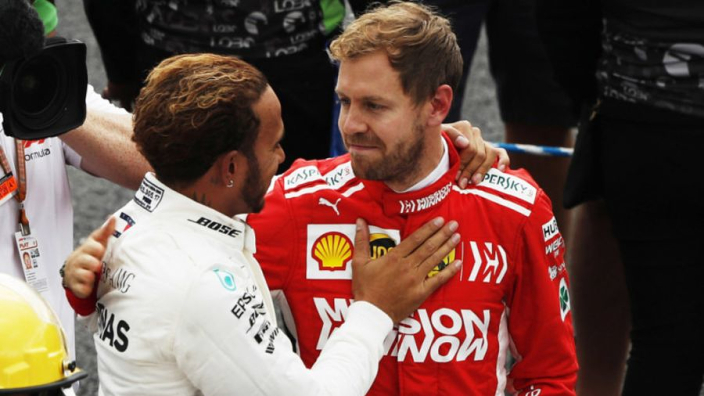 Lewis Hamilton believes Sebastian Vettel is happy to accept that he has been the best driver in Formula 1 through his recent run of dominance. Hamilton has won four of the last five drivers' championships as Mercedes have stolen a march on their rivals in the V6 Hybrid era. Hamilton has won 51 of the 100 races since the beginning of 2014, Vettel's career win total is 52 – despite enjoying a similarly glittering run between 2010-2013, when he and Red Bull were crowned champion each year. Vettel and Ferrari have brought the fight to Hamilton and the Silver Arrows in recent seasons, falling short in 2017 and 2018, but going close. And Hamilton hopes that his key rival recognises his achievements in the same way that he does Vettel's previously. "No matter what we've been through in the past, things that we've done, I think Sebastian knows how hard it is to do what we do," Hamilton said in a feature on Mercedes' website. "And he knows that it's not by luck that the results have been the way they have. "When he's won his championships it's not been by luck and vice versa."